The outer layer of skin is called the epidermis. Epidermal cells include flat squamous cells, round basal cells, and pigment producing melanocytes. The dermis is the deeper layer of skin and contains the hair follicles, oil and sweat glands, and blood vessels. Skin cancers can arise from any of these skin cells. A biopsy is usually required to confirm the diagnosis of skin cancer. Excessive exposure to sun is the single most important factor associated with skin cancers of the face and eyelids. Fair-skinned people develop skin cancers far more frequently than darker-skinned people. Skin cancers may also be hereditary. The most common types of periocular (eye area) skin cancers are basal cell carcinoma and squamous cell carcinoma. Either may appear as a painless nodule, or as a sore that won't heal. The skin /nay be ulcerated, or there may be bleeding, crusting, or the normal eyelid structure may be deformed. The eyelashes may be distorted or missing. Melanomas arise from the pigment-producing melanocytes. This is a less common but more serious form of skin cancer. A mole that bleeds or becomes tender, or one that changes is size, shape, or color, should be evaluated by a physician. Sebaceous gland carcinoma arises from the oil glands in the skin. This is also a more serious form of skin cancer. It may appear as a thickening of the eyelid, or as persistent eyelid inflammation. 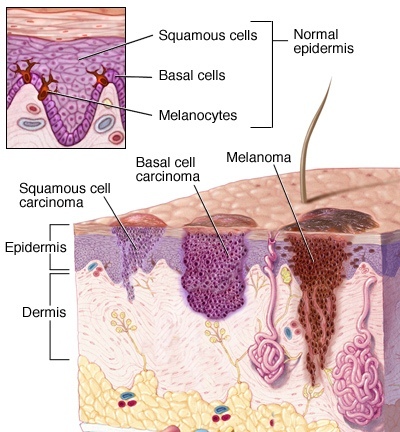 Basal cell and squamous cell skin cancers enlarge locally and rarely spread (metastasize) to other parts of the body. Left untreated, they will continue to grow and invade surrounding structures. When detected early and treated appropriately, there is a better chance of removing the tumor completely and minimizing the amount of tissue that needs to be removed. Melanomas and sebaceous gland carcinomas can metastasize to other parts of the body through the bloodstream or lymphatic system. Prompt, aggressive treatment is necessary because of the risk of early spread. Surgical excision is the most effective treatment for peri-ocular skin cancers. There are two very important principles in treating skin cancers—complete removal and reconstruction complete removal of the skin cancer is necessary to reduce the chance of recurrence. Reconstruction of the resulting defect is tailored to preserve eyelid function, protect the eye, and provide a satisfactory cosmetic appearance. Dr. Landa may recommend surgery to remove the cancer using frozen sections. In this instance, the surgeon removes the lesion with a small margin of normal tissue. The specimen is quickly frozen and the pathologist examines the tissue to determine if the entire tumor has been removed. Once this is confirmed, the area is repaired. How the area where the skin cancer was removed is reconstructed depends on the size of the defect left behind. Smaller defects can be repaired by suturing the edges together. Larger areas may require local flaps or free skin grafts to close them. Radiation may be useful for patients who cannot tolerate surgery, or in addition to surgery in more aggressive types of skin cancers. Recurrence is rare but may occur even after complete excision of a skin cancer. Recurrence is much more common if the lesion is not completely excised. If the skin cancer involves the tear drainage system, the eye may tear afterwards. These conditions can usually be treated with additional surgery. Bleeding and infection, which are potential risks with any surgery, are very uncommon. As with any medical procedure, there may be other inherent risks that should be discussed with your surgeon. Early and complete removal of periocular skin cancers is vital to reduce the chance of a recurrence, and to reduce the risk of spread to other parts of the body. Careful follow-up after surgery is necessary to look for recurrence and to look for new cancers so they can be treated promptly. Patients are most commonly treated by ophthalmic plastic and reconstructive surgeons who specialize in diseases and problems of the eyelids, tear drains and orbit (the area around the eye). You should look for a doctor who has completed an American Society of Ophthalmic Plastic and. Reconstructive Surgery (ASOPRS) fellowship. This indicates your surgeon is not only a board certified ophthalmologist, but also has had extensive training in ophthalmic plastic surgery. When you are ready, you will be in experienced hands. Your surgery will be in the surgeon's office, an outpatient facility, or at a hospital depending on your surgical needs.